The Hearth at Stones Crossing was clean and nice. Everybody seemed happy. The downfall is the facility felt like a hotel and its two stories. It's set up exactly like a hotel or a large apartment complex. I feel like if they're on the second floor and not feeling well, or it's a long distance to walk, residents might opt not to leave their rooms, and that would not be good. My mom was at The Heart at Stones Crossing – Keepsake memory care unit. Overall, our experience was fine. She had a nice room, and the staff took good care of her, although she wasn’t there very long. The memory care unit's atmosphere was fine. They had a nice dining room and a nice area for the residents to sit and do exercise. Food was so-so, but Mom didn’t eat much. The staff were very professional, accommodating, and did their best to help us. It worked out fine. I toured this community in January for a family member who has since passed away. I was impressed with the interaction between the staff members and the seniors. I was introduced to a few people that lived there and was able to ask them questions and gauge whether they were happy living at this community. All of the staff members that I interacted with were very helpful and kind. I received a letter in the mail after my mother passed away sending condolences. I toured 4 different senior communities in the Greenwood area and the hearth would have been my top choice. The Hearth at Stones Crossings was more institutional, like a nursing home. They had an activity room, but I didn’t see that much full physical activity or physical therapy happening in that small room, so I probably wouldn’t recommend them. The type of activities they seemed to have were more like what you would find in a nursing home. The best way to get to know a community is by scheduling a tour. 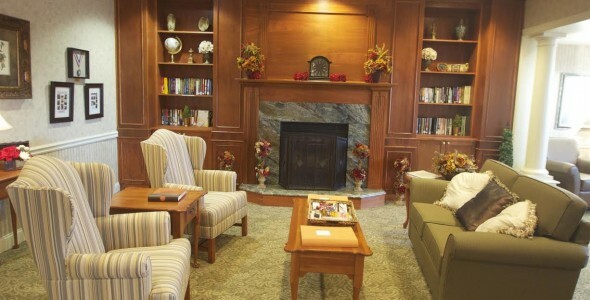 See the facilities, meet the staff and residents, and get a feel first hand what it's like to live at The Hearth at Stones Crossing Assisted Living. Home is where the heart is, and at The Hearth at Stones Crossings, we strive to create such an experience for our residents. Our community is filled with inviting gathering areas where friends can meet for a chat and engaging off-site trips have residents always learning something new. Whether you are an active senior seeking a respite from home ownership or seeking memory care for your loved one, we offer a variety of lifestyle options to meet your needs. The Hearth at Stones Crossing is one of many communities operated by Hearth Management, an organization committed to H ealth and wellness, E ducation, A dvocacy, R espect, the T otal person and H ome. At our communities, we provide a full range of exceptional senior living options that are designed to allow seniors to get the most from their retirement years. Every day the recreation calendar is filled with engaging on-site social programs, fitness classes and club meetings. Activities include happy hours, think more, bingo and table games. But for those times when you want a laid-back day, there is an inviting library or activity room where you can read a book or work on a puzzle. Joining The Hearth at Stones Crossing means you can say goodbye to cooking and let our chefs handle that responsibility. Three times a day, the dining room is filled with the mouth-watering smells of home-cooked meals, and on special events, themed meals make the occasion even more festive. Other chores you can say goodbye to include laundry, housekeeping and driving for errands. Premier senior living that has engaging activities, homelike surroundings, friendly staff and more are found at The Hearth at Stones Crossing.